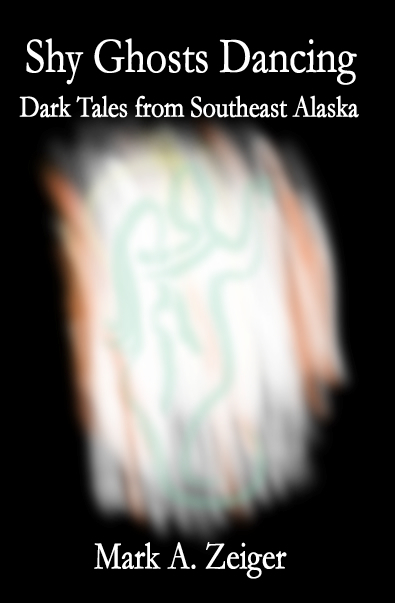 Mark's first book, a collection of his horror, dark fiction, and fantasy short stories, set in or otherwise relating to Southeast Alaska, is now available! Order now or read excerpts below. Shy Ghosts Dancing: Dark Tales from Southeast Alaska presents stories of darkness, mythology, and danger, examining the mysterious and unpredictable nature of life in Southeast Alaska, where perception and reality intermingle and conflict with puzzling and sometimes deadly results. Click on the titles below to read an excerpt of each story. Shy Ghosts Dancing: Watch a young man’s feelings for a beautiful woman turn from attraction to horror when voices from the aurora borealis tell him her terrifying secret. The Fear: A man finally meets the predator he’s lived his life dreading. Long Black Veil: Join an adulterous young woman’s nocturnal vigils in a gold rush town cemetery. Ghost Wanted: A want ad placed as a practical joke leads to unexpected results.
. . . and 8 other stories, including The Raven Calls at Dawn, previously published in Shapeshifter! Magazine. Here's the Book Teaser that Aly and I shot for the book, and posted on YouTube. Looking for Reviewers' copies? They're available here. You may also purchase copies at The Babbling Book, Alaska Rod's Knives and Salves, or the Sheldon Museum gift shop in Haines, Old Harbor Books in Sitka, or Hearthside Books in Juneau. Ask your local independent bookstore wherever you live! Order directly from us (100% of purchase price benefits us rather than middle merchants).